A Civil War veteran swears revenge when his father is murdered and his ranch burned down. He soon kills four of the five men responsible, but does not know the identity of the fifth. His search for his final target leads to a conflict with a crooked cattle baron. Western, starring Rory Calhoun and Kristine Miller. 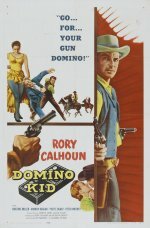 Rory Calhoun is quick on the draw as a Civil War veteran who seeks vengeance for the murder of his father.